Researching Eastern European ancestors who came to America includes a heavy amount of research in U.S. records for information about their life after immigration, and to find clues to immigrant origins. This webinar sponsored by the Genealogy Roundtable of the Utah Library Association about online records available from the Library of Congress may be of help in doing your homework on this side of the pond. 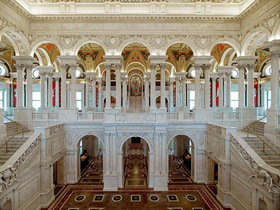 With the Library of Congress being the largest library in the world, it has many online resources that can benefit people researching their genealogy. During this session, participants will learn about the 51 million online resources available from the Library of Congress’s website, including a lot more than just book, such as photographs, sound recordings, oral history narratives, newspaper articles, etc. The session will cover library/archival searching techniques that can be used to navigate the Library’s website and locate possible treasures that patrons can use to learn more about their family history. Byron Holdiman is the Director of the Library of Congress Teaching with Primary Sources grant at Quincy University in Quincy, IL. He has worked with the Library of Congress program for the past 13 years at Quincy University and California University of Pennsylvania assisting K-12 educators and university in using historical documents in their class to help their students to learn history instead of just memorizing history. He has a B.A. from BYU in History/Genealogy and an MA from the University of South Florida in Library and Information Science.